This narrative gives an overview of a meeting bringing together teachers, staff members and students for an intensive week of training. It is a collective reflection. The staff training week was designed in such a way that all participants could contribute to the programme with exercises or presentations that were then subject to feedback and reflection. As the topic was mentoring, a group mentoring approach was used to explore it. The following narrative is a reflection in action where we zoom in on the arts based inquiry and exploration around the shared question ‘What is good mentoring with - and for - a mentee in the context of a professional practice, effectively embedded in our institutions?’. Every group member contributed to this narrative with descriptions of what happened, reflections and comments. The aim was to do this from four perspectives; the participant’s personal experience, the activity/exercise, the group dynamic process and the relevance and value for the international development of mentoring practice and its institutional implementation. This report may serve as an inspiration to others involved in mentoring in higher music education. It describes the work in some detail from day to day, what we did, with mini reflections from group members. Every participant will have come away from the staff week with their own story, new insight and experience. But reflecting together on the process, members agreed that it was not least the nature and power of the approach that they took away. An approach that seemed to made explicit everybody’s viewpoints and unfold deep and meaningful conversation. This is why we want to share this with you. We attempt to shed light on our journey by presenting our collective narrative story of the week. Þóra reflects: As a chair of the mentoring working group I found myself in the challenging position of leading the staff training of this diverse group of professionals from different institutions. The partner institutions stand quite differently when it comes to mentoring. Some, like the GSMD already have been developing a mentoring-coaching approach for some years as a support for students professional and personal pathway, for staff development and as an approach in facilitating learning. Other institutions do not formally have mentoring as a part of their curriculum, however they see the potential of mentoring but feel the need for more grounds and support. Then there are the institutions offering the NAIP Program that have mentoring as a module in the program. We had been reflecting together on our experiences of mentoring practices within our institutions and its potential. Our work had included reflecting, collecting resources and sharing mentoring experiences from the disciplines of theatre, opera, dance and music but also medicine, education and psychology. Aiming to identify opportunities for development. All of us are artists as well as educators but our work during our meetings had been quite formal and practical, centred around a meeting table. We had agreed that our training would be about practical work. There was a need for doing stuff, feeling, experiencing and trying out different approaches and that would contribute to our repertoire as mentors and deepen our understanding of mentoring. Ideas were thrown around about getting experts in to lead the workshop but in the end we decided to draw on the expertise of the group; we would all bring something to the table. Helena Gaunt had offered her help and I was lucky to talk through my ideas about group mentoring and get input from her as I was preparing for the Staff Training. She encouraged me to try out my ideas.I had come across some interesting ways of leading group mentoring, an approach that I had wanted to develop further. I worried that the group would not buy into my idea, and realised that it would take some courage to follow it through. And after thinking and discussing this with Dinah we agreed that it would be vital for the plan to work to get away from the table. So that is how our week of Staff Training began. The meeting table placed unimportantly to the side in a large air-conditioned hall. The objective to get the artists away from the table. In order to establish that the room would be used flexibly and we could see each other without barriers. Who are you and what do you love about what you do? Þóra invited us to begin our conversation together by not only introducing our names and professional positions, but also to talk more personally about what we do. Each of us was invited to tell the group what we love about what we do. This was a very strong and simple way to begin the conversation between us. It allowed us to see more of each person in the room and their reason for being in the room. And more than that, it reminded me to pay attention to my motivations for being there from the very beginning. "the thing I love most about what I do is..." This encourages a present and shared exchange. In the passionate thing, telling about the love of, there was a collective language developing already there we can now see afterwards. And what a powerful way to start the week. A model for a way to meet. Exercise: Leading by the fingertip. In the spirit of thinking through doing, we were quickly on our feet and sharing exercises and approaches. It started with an offer from Renee, who guided us through an exercise called Leading by the fingertip. The exercise is built on the principle of exploring one’s willingness to lead and be led. It is a simple exercise but has the possibilities of revealing a lot through the practice of it. I found a lot value in the simplicity of the exercise, but also the potential to reveal deeper insights into our tendencies of how we lead/follow. I thought this would be a great exercise to stimulate discussion among the YST Conservatory 2nd year undergraduate students who had their ‘Leading & Guiding through Music’ class that afternoon. The exercise was well received by the students, one student commented “I now realize I need to be paying more attention to the subtle movements and behaviours of the people I work with, and how my actions affect the people around me”. Natasha also dropped by the class to meet the students and observe them in session. A crucial part of day one, was establishing a way of deciding and articulating how this group would like to create a work space for their learning or the task that they are embarking on together. For this process, Dinah was invited to lead a process called Designed Alliance. What do you wish for making the time together a good experience? How do you want to be together when things are difficult and there is conflict? This process gives the group shared ownership and responsibility for their interaction with each other. The designed alliance can be adjusted or modified to suit a changed situation. The underpinning principle is that it is an alliance designed by all parties. Dinah has used this exercise before in one-to-one teaching as well as a way of empowering the learner and reminding herself from the beginning that a stated belief of values and procedure gives equality to the relationship. 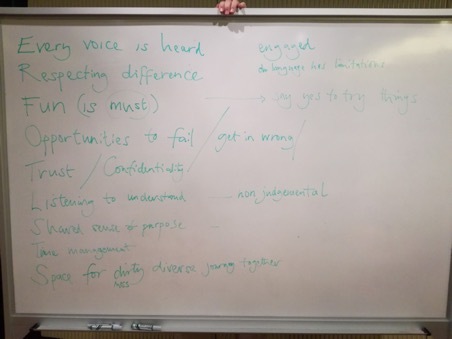 A number of voices in the group found it a tremendously useful and important exercise for ensuring all voices are heard, giving visibility to the hopes and aspirations of the group in terms of how the group will work together, as well as the concerns. Image of the designed alliance that we made as a group. Following the designed alliance, Marc requested that we take two minutes of silence to give space for what we had just contracted together. Out of that silence came some reflections on how this group empowerment exercise, can also be potentially oppressive to certain views. We discussed how the process took place in practice, how it was experienced by the group and to what extent its promise of empowerment was fulfilled. Largely people were very positive about the exercise, and felt the rewards of doing such an exercise as a group, but a concern was raised that the power of a circle can also be quite oppressive to certain views. The was a concern that with a group circle, there is a momentum that is generated by a circle that accumulates around certain ideas, and this can make it hard for certain voices to be heard. What did we promise? What do we need? Why are we here what do we need to do.. now we need to play experience! We need to know what the feedback collected did. Having shaped a contract as a group regarding how we want to work together, we also needed to agree on what we wanted to work on. Everyone in the group was invited to share their questions, hopes and objectives for the week with the rest of group. The rest of the group in turn then voted on where they shared the same priorities. We then compared these questions and objectives with our pre-existing, and discussed whether our current plan would meet the shared and different needs among the group. This became a fairly rigorous and predictably challenging exercise. Of course – we used the designed alliance we made to conduct this process, but still it was challenging to take into account all the different hopes and needs. We took a break and used the break to allow everything to sink in. Upon our return, we reviewed the questions we had raised as a group and became aware that a big and important question was missing. Namely, what are the guiding ethical principles and protocols of mentoring? To what extent do each of us operate on differing guiding ethical principles? How are we to learn from each other’s stand point? We had discussed this a lot in our meeting in Iceland where we’d had a visit from a clinical psychologist. How can this become a central part of the week? We discussed how we could ensure this was addressed over the course of the week, and highlighted the sessions where it would be dealt with most directly. The Environment Model is a tool for examining artistic practice and identity, and how this is situated within a wider context. Being to locate our practice is particularly useful in a learning environment - by being better able to articulate and share experiences we can gain further understanding of not only our own practice, but of where there might be possibility for greater challenge, stretch and growth, both as individuals and when we work in collaborative learning contexts. The model maps an individual artist’s directionality or preference in a three-dimensional space along 3 spectrums of practice - the first exploring the dynamic between the individual and the collective, the second the distance between creation/composition and interpretation/performance, and the final line exploring the relationship between known and unknown, a spectrum of familiarity and comfort zone. Begin by setting up the model. You will need three long pieces of string or yarn. Place one across the space, between two opposite walls and fix into position around waist to shoulder height. If it is not possible to fix the string to the walls themselves, use chairs, stands or other furniture. Similarly, place another length of string between the other two opposing walls. Place the final length of string from ceiling to floor in the centre of the room, so that the three strings have a centre point. If it is not possible to fix the string to the ceiling itself, find a spot at some height from the floor in a corner and fix the other end to the opposite corner on the floor, so that you have a diagonal length from above to below. You may have to adjust the angle and length of this string to create a meeting point for all three strings in the middle. Finally, take 6 pieces of paper. Write ensemble/group on one and solo/individual on the other, place these at either end of one of the wall to wall strings. Write performance/output and creation/making on two more pieces of paper and place these at either end of the second wall to wall string. Write known and unknown on the last two pieces of paper. Place known at the top of the diagonal string and known on the floor at the end of the diagonal string. Each take a moment to think about your own artistic practice and about the kind of environments that you are most happy working in. First, think about it in terms of working in a group and on your own. Where along this spectrum am I most at home? As an artist what is my preferred mode of work? Am I happiest when working on my own, sitting at my desk or working in the practice or studio? Or is it easier for me to work alongside others? In duos, trios? In large ensembles, companies or collectives? Bearing these questions in mind, each take a piece of paper and tape and choose a place for yourself along this spectrum. Be careful to choose a spot which represents where you are most happy and satisfied - your natural, most preferred place. Using one of the pieces of string fixed to the opposing walls, write your name or initials on the paper and tape it to the string. Now take a moment to think about your practice in terms of working from scratch on new ideas, or working in a more refined, rehearsal focused sense. Where would you place yourself on this spectrum? Are you happier working with formed text, repertoire or content? Do you enjoy working from scratch? Do you enjoy refining, honing, rehearsing or do you have a preference for making, creating, constructing? Take another piece of paper and tape and choose a place for yourself along this spectrum. Again be mindful to choose a spot which represents where you at your most content. Using the piece of string fixed to the other two opposing walls, write your name or initials on the paper and tape it to the string. Finally, think about how you most like to work in terms of how much you know, and how much is left open or unknown. Do you do your best work within highly structured environments or more open formats? Do you feel most free when you have restrictions or limitations or when you have a blank canvas? Do you prefer seeing where the material takes you or constructing material based on where you would like to end up? Take a final piece of paper and string and write your name or initials on it. This time place it in a position along the string that extends from above to below, with the unknown being above and the known being below, on the ground. The last step involves triangulating between the three pieces of tape you have placed along the different lines to find your particular spot within the model. Have everyone do this at the same time, finding where they sit in relation to the spectrums and in relation to each other. Where are you now? What do you notice? How do you feel? Where would you like to be in two months’ time? In one year? In five years? Think of a particular moment in a project or class when you have faced considerable challenge. Does the model shed any light on that particular learning or working environment and how it was working for you? We have particularly chosen the use of preference in this model as it assumes a particular take on identity - not as something fixed, but as something that can change, respond and move. We have the ability to engineer how we think about our work and ourselves. Greater self-knowledge of our natural ‘home’ or preference allows us to better understand when we feel challenged, where it might be coming from and how to work to our strengths. Spectrums are important in offering an alternative to a dichotomous view of artistic practice. As professional artists we may be asked at different points to jump from one ‘location’ in the environment to another, and we may happily and successfully negotiate these movements. The Environment exercise was fun and innovative, it promoted reflective thoughts like: who am I as an artist/musician? How do I like to work? Not the least to do this together with the group, having to place oneself in a three dimensional space and to see this in relations to others. And it felt really great to be thinking on our feet, as a body in space. Natasha’s wool game proved to be a great way to illustrate network connections and relationships and to bring to light the person's position in it. It allows reflection on one’s present position, in which the participant feels either safe or stuck. And it allows for reflection on a possible preferred or more empowering position. It also enables raising awareness of the positions - in the present, and preferred future positions of others and of the distances in space. At the same time it also fixes the participants to a stable position which would not necessarily be true in reality, and within the framework of the exercise it is a challenge to represent fluidity and movability. In that sense it is polarising; one can be either in this, or, in that position. However, considering the short time we spent on the game it is unfair to say anything limiting and reductive. It is advisable to keep exploring the powers of this playful representation of a network of relationships with all its complexities. In extension we could look at other games that playfully explore the dynamics of complexity in groups (e.g. Systemic Constellations). Following the group exercise led by Natasha, Dinah led us through an exercise organised around radical listening. The purpose of the exercise is to give people space to really discover how they relate to the topic that the group are dealing with as a whole, what knowledge and experience do they bring to this area of focus, what questions do they want to raise, what is at stake for them? STEP ONE: MAKING NOTES ON AN ISSUE. Not that difficult to do. In this context the challenge was to choose something interesting enough but not too personal to talk about to somebody I didn't know very well. STEP TWO: SPEAKING IN PAIRS. Speaking: To speak for 6-7 minutes, to somebody who wasn’t allowed to interrupt with questions or comments but was supposed to keep an interested attitude, was a good way to be forced to sharpen the thinking and the way of phrasing the worlds. It was, for me, easier to concentrate hard this way then if I had just been sitting alone with my own thoughts. And using the voice speaking the thoughts out loud, instead of just thinking them, also made a difference. The process made the thinking ”slower” which felt as a good thing because it made it more precise. There was a little element of stress. ”To take this time from someone who isn't allowed to do anything other than look interested, at least I have to try to be an interesting and honest storyteller”, I thought. Listening: This part was easier. The ”gag” was quite easy to handle. The challenge was to, honestly, keep the interested attitude up when the talker sometimes took extra-long time to phrase the thinking. A good exercise in patience for the listener. Conclusion: To be able to speak, or listen, without verbal interaction, just be met by or act out an interested attitude i found to be a most valuable experience and an excellent mentoring tool. It's so easy to interrupt to ask follow up questions without considering that by doing so you also will steer the thinking of the talker instead of helping her/him to find his/her own solution by speaking out his/her own thinking. Of cause also conversation, with verbal interaction, is necessary but perhaps not at all so often as we think. That was my reflection after having done the exercise. Tuesday began with the late arrival of one of the group members. After a mix up with flights, this member arrived late to our week-long staff training and needed to be brought up to speed. Her arrival also brought questions, as she was bringing with her a lot of research and data that needed to be worked through before the week was out. We discussed the plans for the week that we had made the previous day, and made decisions about how we would work through the data that had arrived. It took the whole day for for this overflow of emotions to truly melt away. For the group, it was readily understood and accepted that these kinds of things can happen, but for this group member it felt significant, and it was an important reminder of the reality that these group working situations are always in negotiations with everyone’s different emotional states. This is something that needs to be cared for and worked with within the group situations. At the same time, the specificity of doing this whole thing in Singapore was reflected upon on. The twenty hours of travel, the feeling of fun and joy when arriving at the accommodation and bumping into group members coming back from the swimming pool, the warmth of the tropical climate, the heavily air-conditioned rooms and the amazing food on offer. All of these factors contribute to how the group work with each other, all of these factors are influencing how we are dealing with things in the rooms. It was interesting how someone’s late arrival - due to flight-time and time zone misunderstandings - had an impact on the group process. The day began with Ulrika sharing an exercise she was borrowing from a practitioner called Anna Sims. Breathing is essential for the human body; it’s the first action of a new born child. Singing is all about breathing. Air passes through the vocal cords and makes them vibrate, which results in sounds. The diaphragm is the breathing muscle, that moves down when breathing in and moves up when breathing out. In singing the movement of the diaphragm is connected to a variety of different needs according to different singing qualities. The focus in singing is the control of the breathing. As such, to warm up the voice is to make contact with the breathing. This breathing exercise seeks to activate the breathing muscles and extend one’s breathing ability for vocal technique. It should support the vocalist to control the air through singing phrases, relaxes and opens the larynx and give focus back to the mind. Standing together in a circle and having Ulrika walk us through these exercises gave a lovely feeling of both connecting to the body and the breath, and to the inner space, but as the same time it created a strong situation in which we were facing out towards the others in the group and collectively moving together. I felt that the exercise tuned me into my own body, into her own breath, as well as connected me to others. I was impressed by how quickly we warmed up through this exercise, how it awoke the group and created a shared sense of focus, vitality and readiness to work together. This reflection also points to the transferability of many of the practices we are sharing. It is an exercise that is designed to train the breathing of vocalist, but equally it is very strong as a a physical exercise for warming up a group to work together. On Tuesday morning Magdalena was asked to present the survey about mentoring in NAIP that we conducted between December 2017 and January 2018. We gathered data through a questionnaire filled in by 27 students that have been mentored in the NAIP programme and a questionnaire filled in by 7 mentors. First, Magdalena handed out the main results of the student feedback, but quite soon our group divided into pairs or small groups focussing on the different topics of the feedback and reading the original answers of the mentees to the five main questions (what went well? what could improve? what could make mentoring more effective? role of the mentor?). Mentoring provides a space for students to explore their needs and objectives. It is a space for receiving support, encouragement and building trust in the student for the work to be done. It involves seeking a deep understanding for the learning needs of the mentee. It provides a platform for developing a professional network for the mentee. space for solving them. This is the work of the mentee themselves. Historically, students on NAIP have experienced that group mentoring sessions can create a lack of clarity around the purpose of the meeting. They proposed that there should be a clear separation between discussing practical issues regarding the organisation of the programme, and mentoring meetings. There should also be more care taken to ensure that time is shared equally between people. More clarity around the purpose of sessions. Some felt there could be a better balance between directive guidance, in terms of supporting a mentee to make a plan, organise around deadlines and so on – and space for speculative exercises that involve outlining goals and objectives. Important for mentors and mentees is to continue to stay open to possibilities and questions. Especially those of us who already are mentors within the NAIP program were very curious to hear the student’s voices and their original feedback. Magdalena prepared an extra document with the extended version of her handout presented in Singapore – with a selection of student’s quotes which one of our small working group decided was important to include as a summary in original voice. The student feedback informed the work of our group for the rest of the week. We returned to the main results as a core reference point throughout, addressing in particular the repeated call in the feedback for more structure, for more awareness of the role of a mentor and for more concrete tools for mentors to support the artistic and personal processes of the mentees (i.g. the mentees asked “to be asked the right questions!”). We decided to share practical tools with each other to discover different approaches to mentoring and coaching. We agreed that mentoring within NAIP really needed more attention, reflection and “quality assurance“. The second part of the presentation concerned the reflections of the mentors themselves. After our meeting in Iceland, an email was sent to eight mentors within the NAIP with idea to collect their stories and possibly include them into our final report. Three of eight mentors sent their reflections, and in Singapore, after having read the student feedback, we adapted the questions and decided to once again ask some of the mentors to reflect about their mentoring. What qualities are essential for you to be a successful mentor? What are the relationships between the different areas of mentoring in your practice? As a mentor, what are the issues in regards to ethics that you feel are important? The themes he was picking up on how and why that influenced his preparation of the feedback. Thoughts are deepening and shifting every single day, behind in a place where you are allowed to think with other people. It made me aware of what needs to be in place. Already reflecting on his practice...looking back to the basics. Marc describes: The ‘Swampy Lowlands’ intervention was based on Donald Schön's suggestion that there are two kind of professionals in today’s complex professional environments; those who opt for the high ground and those who prefer the swampy lowlands. In this session I selected short video selections that allow us to enter the swampy lowlands and enter the reflective practice and dialogical space of the mentoring praxis. This session had two objectives. Firstly, I wanted to share the concept that video and film can be used as a mentoring tool. It can act as a catalyst for conversation and exploration. The images themselves are meaningless, as Stuart Hall stated. We give everything the meaning it has. The way we give meaning and what meaning we give tells us something about ourselves, our preferences and dislikes. What needs to happen in the institute considering that mentoring needs an neutral, open and undefined setting and is foremost relational? What is doing ‘good’ in that relationship? What informs that ‘goodness’ and that quality? How much room is there for ‘phronesis’; the Aristotelian practical wisdom to apply knowledge and skill to an unforeseen emergent context? When do goals as the empowering and enabling of the mentee no longer justify the means? Does ‘Everything go’? What is at stake for the institute or for the mentoring practice? How do dominant institutional desires and responsibilities aimed at safety, accountability, assess-ability, equality, predictability, control, interfere with the open relational horizontal mentoring space in which a sense of coherence can emerge between mentor/mentee. Do the institute's dominant narratives justify its actions, rules and protocol? Do they lead to good professional work with and for the mentee? Does mentoring fit in the existing institutional paradigm? Does NAIP? Does the institute needs to adjust? Does the institute allow for the open mentoring space aimed at the ‘art' of muddling through and playing in the 'swampy lowlands’. This presentation caused quite a stir and swamp of emotions. Marc was provoking in his approach which promoted deep discussions on ethical and in instances difficult issues. A conflict between cultures and ideas was apparent. Although some issues were not resolved the approach we had been adopting provided a real platform for sharing and listening in a meaningful way where every opinion was heard. Some group members, Thora, Ulrike and Leif, gave a concert at the YST conservatory as a way of offering something to “give back”. …when we got the generous offer from the YST conservatory of them hosting the staff training, we felt like we wanted to give back and contribute something to the conservatory. I asked Ulrike and Leif if they would feel like doing a concert where we would perform and talk about Swedish and Icelandic vocal music. We all agreed that it would be a nice thing to do, although I must say that with the jet lag and all the other work that we had to get done I started to doubt the brilliance of the idea. But it turned out to be a lovely experience and a really nice reception not the least from the voice students at the conservatoire. In the same spirit, Magdalena gave a two hour workshop to a group of students and Renee offered a workshop to a group of students of Bethany. I felt In the midst of enjoying the actual singing and playing that my understanding of Thora, Ulrika and Leif was deepened and I saw them differently for the rest of the time together. I also felt proud that they had offered this to our hosts. Renee lead the days first exercise exploring the importance of eye contact in group work, especially when standing in a circle in two parts. In the first part eye contact comes up incidentally, in the second part purposely. Both exercises lend themselves for reflection. This exercise and many others can be found in the NAIP resources. Another exercise lead by Dinah followed. It was an acting exercise to practise staying "in the moment" "being specific" while present and focused on the other person. In pairs, close together, it can be standing, sitting, kneeling , a verbal exchange using only yes or no as the language. Only one of those words to be said once before receiving the partners response. Try to go as fast as you can without losing intention and while responding specifically to your partners impulse. Change partners and repeat. Afterwards reflect which word you enjoyed saying most. Dina used a seemingly simple yet surprisingly personal and revealing activity as a warm up for our morning session. We were asked to get into pairs and have a “conversation” with one another using only the words “yes” or “no”. This created an exchange where people both instigated and responded to the nonverbal cues offered in the statement of these two simple words. People chose how to express and convey feelings and emotions using facial expressions, vocal inflections, and other body language to try and interact with their partner. I found it personally challenging as it is suddenly a very personal exchange of mixed emotions as well as feeling a need to expand beyond the limitations of the exercise by stringing groups of “yesses” and “nos” together (which wasn’t allowed). A very interesting and fun activity! I enjoyed how the energy built throughout the yes/no exercise. I felt I could get to know my activity partner’s personality through their willingness to play during the exercise. It was a fun and thought-provoking experience: Somehow Renee managed to never say NO but only Yes, in hundreds of different ways – from „yes-yes-yes-YES!“ to a „no-way-never-ever“-YES. Although there was not much time for thinking and reflecting while whispering, laughing and shouting at each other, I remember some thoughts I had about it which varied between: „Wow – my partner does not stick to the rules (even the rules he defined himself) – instead he does his own (fun) thing“. This will be used as a bases for some of the output. This list on embedding mentoring is an important tool for all the dimensions of creating/developing a mentoring program; performing a mentoring program and continuously evaluating the mentoring program. The advices raise awareness of how to handle the overall questions concerning the management vision of the need of mentoring as well as specific questions concerning for example training exercises for mentors and designing a contract for the mentor/mentee relation. As the mentoring program permeates the whole education it’s of great importance to keep the different aspects of mentoring in mind so this “list” is a good reminder on the road. Important in order to keep a healthy balance in the mentoring relation. It will increase the possibility of maintaining the quality of good mentoring by keeping to the agreed questions. It will help the mentor/mentee to keep the course orientation. Important to be aware of how to prevent from overrun of human borders. Clarity in what issues/substances should be processed and not in mentoring. Ability to advice a mentee to seek help or counselling elsewhere. Important for building a trust between the mentor/mentee. Clarity of “why” and “how” a working/meeting place is decided. Avoiding misunderstandings about the purpose of the session. Gives tools which increase the safety and the trust between the mentor/mentee. Recognise/emphasize the mentoring already being installed. Increases the teachers engagement to developing mentoring further. As mentoring is looking at the overall situation it might be good to have mentor not being an expert in the field, but looking at the overall questions and goals, beyond the challenges and issues connected to the skills. This mentor might perspectives from another angle. The management has the vision that mentoring is useful and important. Renee describes a tool for mentoring that is inspired by the research of Dr. Rineke Smilde ( Musicians as lifelong learners.) It is an exercise in two steps. First the mentee is invited to make a document in her/his own language, jotting down as many memories as possible related to the question: what moments have been significant for you becoming the musician you are now. This writing process can take weeks or months and is strictly private. The mentee does not have to share this document with anybody. The next phase lets the mentee develop ‘codes’: categories of statements that can be found in her/his writings. Applying these codes may show patterns that give an understanding in how the mentee has become the musician/music student they have become. In this workshop, the participants were given the assignment to do something alike, only looking back on their journey from home to this meeting in Singapore. The biographic narrative writing exercise that Renee asked us to do proved to be an effective way to reflect on one's own experience and to make sense out of it by zooming in on its. By writing a personal short story you suddenly remember small details that have great meaning. And interestingly also provide meaning for the actual group process at the present moment. Personally I, suddenly saw a unexpected connection and tension between being ecstatically happy with the noise reducing power of my ‘noise-reduction earphone’ in the airplane and my professional desire to embrace the ‘noise’ and the noisy, swampy, messy spaces that can occur in the mentoring practice and stay/work with them in the practice. It reminded me that reduction can also be quite useful but/and that we need to be careful, because, like in gardening, when reduced too much, something might die. Alex introduced a method for reflection called “Questions, questions”. As a way of reflecting together on a topic you start with a question that you would like to answer. One way of doing this is to write the question on a computer connected to a screen so that everybody can see it. Then the group is invited to find questions for this question and add. These are any questions that this question might spark. You then go on and on adding new questions without trying to provide answers. Questions, questions - I like this one. Fun, open and freeing. But also I have a feeling of not having enough space or the kind of space I need to think, or to think of questions. I feel slow! Alex mentions that sometimes this exercise is done in a more performative way, where each question-maker has to step into a middle space and write the question down. Maybe this would allow for more space? As it is I have the feeling that we are queueing up to say our questions without listening to or responding to the one before, and the note-taker frantically scribes. But even so, there is an ebb and flow to our group thinking, and a different quality of thinking I enjoy. I’ve used this since with two different groups of students and have seen the different places we can go in our thinking together. It is so important to have tools like this which allow groups to break, change or make shifts --- this is something we’ve found in our own time together in Singapore. How do we do our best thinking/working together? How can we incorporate elements of our artistic practice in order to facilitate better or different thinking/writing/working? We have so much skill at facilitating collaborative work of an artistic nature, so how do we harness these skills for collaborative work of a more academic or reflective nature? During the staff training the work is not limited to what happens during the formal sessions. But the whole time that the group spends together the exchange continues and no less important connections and meaning is constructed. On this day the lunch was no exception. We would like to include a reflection on this from one of the group members. For lunch the host of our staff training week, Bernard Lanskey, piano professor and dean of the YST Conservatory of Music, took us out for lunch. Not just a lunch-lunch – it turned out to be another experience of Singaporean „savoir-vivre“-way of having a lunch break: Due to the size of our working group a few taxicabs had to come to take us from the conservatory to the Yacht Club at one of the waterfronts of this impressive city, where we were seated at two grand, round tables, soon crowded with finest specialities of asian, and especially Singaporean foods and drinks, well and generously chosen by Bernard. But the lunch was not only full of most delicious dishes, but also full of exciting stories from behind the scenes of the conservatory and its visions and aims as how to grow into a classical music market in East Asia. Bernard, who for many years used to be Assistant Director of Music at the Guildhall School of Music & Drama in London, 2008 was appointed director of the YST Conservatory of Music in Singapore, which was only funded in 2003. For his students Bernard has visions of not only becoming excellent musicians, but also courageous, innovative artistic and pedagogic leaders in the East-Asian world, which in most parts (especially in the rural areas) is not yet as saturated as in Europe, USA, or in Asian main metropoles. Bernard sees most potential in the so called „Contextual Engagement“, for which his over 200 hundreds well chosen students develop the necessary skills within the Professional Integration and Community Engagement programmes and modules. For me this lunch was a very important, eye-opening lesson, since until then I had the image of Asian classical institutes and their students trying to copy the western culture and tradition as well as possible. Here I learned just the opposite: a very conscious vision of Asian’s own identity and the many still undiscovered opportunities within the manifold Asian culture, with their own needs and prospects. It is not at all about copying but about creating new ground – but with traditional tools, learned at its best, be it from an Asian singer or an Australian pianist or Russian violinist. The artistry is always personal and individual, the professional calling mirrors and nurtures the culture around the artist. Sometimes it can be easier not to first have to overcome a strong, heavy-lasting tradition (e.g. of respected jobs within the classical world) but to uncover a new voice in oneself or to discover a new landscape of possibilities around oneself. Bon appetite, young musicians! Alex introduced to us the DasArts, now DAS Theater feedback method. A method developed by DasArts in Amsterdam together with philosopher Karim Benammar. A way for a group to reflect together on an artistic project. The aim is “to empower the artist who is getting feedback on his or her work, to go beyond the pronouncement of judgments, to allow fundamental criticism, to create a sense of (self-) discipline for the sake of precision and clarity, and, last but not least, to increase the enjoyment of giving and receiving feedback” This proved to very inspiring to many of the participants who saw similarities with the more familiar Critical Response method developed by Liz Lehrman. We did some practical feedback exercises where a group member offered a work in progress. A completely new approach to feedback in this model that I haven’t really experienced before. I find it extremely spacious and freeing as an artist. The structure is heavy and present, but it serves to distinguish lines and boundaries which often get soft and blurred in the giving/receiving of feedback. With this lack of soft/blurred edges I feel a sense of clarity and a strong sense of owning my own material and how I choose to take forward the feedback I have received. After the session in my own reflections I realise how often I am taking care of the feedback giver as an artist - I want them to know I value their opinions, will take them on board, care about what they think and that they are being heard. In this model there isn’t space for this - I am often not a part of the discussion when the group is doing their responding, and when I am doing mine, I feel encouraged by the structure not to engage specifically with the person giving the feedback, but with the feedback itself. This freedom to centre the feedback on the work and the next steps from the work feel crucial to me - I am free from the social and interpersonal obligations of giving and receiving and this feels wonderful! I don’t have to worry that someone will think I don’t value their opinion, I don’t need to find an answer for every question or thought on the spot. Like a good coaching or mentoring session, it also feels the work is balanced in the right way - the feedback givers do not offer their thinking and passively sit aside to see how I receive it, nor do they have the opportunity to convince me of an perspective or enter into a discussion. They work hard to do their best thinking around the work itself, and offer this to me so I may decide where to take it. It is one of the first times that feedback (and also very critical and questioning feedback) has truly felt like a gift! Of particular note -- the discussion in pairs at the beginning seems a wonderful innovation. I have some experience of Critical Response, and this has always been one of the most difficult steps to get for students -- how to circumvent initial responses, to not allow space/room for immediate thoughts/likes/dislikes, but instead go straight to statements of meaning. I enjoy that in the Das Arts approach there is a moment to just get your thoughts out by speaking to someone straight away, with a freedom from it being part of the feedback. I sense that maybe having had these discussions straight away there is less care and avoidance… like in a meditation, simply acknowledging the thoughts allows us to let them go and have other thoughts, so there isn’t a need to suppress or hold off from a burning thought, opinion or observation. Also the section on perspectives. This feels fun and creative but also quite direct. Feedback givers can offer their opinion and needs, but need to own the perspective they are speaking from. As an artist I feel a clarity in this acknowledgement of perspective - I have agency to decide whether or not this perspective is important in my work… the clarity allows me to more fully understand the feedback. And finally the associations. I love this! Thinking openly, freely and finding new ideas or understandings. I like the physicality of this one too. And find genuinely new connections for myself between this work and my practice more generally. And the letters! What a wonderful thing to receive a letter from these wonderful people. I feel so thankful for the opportunity. The process has genuinely impacted the work - along with my co-writer, Detta Danford, we took on some of the feedback and used it to sharpen our conceptual thinking and clarify next steps. We’ve just heard this week that we have been awarded a Time and Space Residency from Metal, Southend, something that perhaps wouldn’t have happened without this valuable moment! As an artist I have shared this method with my colleague and perhaps we will use it in our work from this point forwards. In my own group mentoring and teaching at the Guildhall School I have introduced the model to two different groups of students. Very successful so far! We started the day in a circle, singing the chant “Good Morning” which Magdalena sang to us, and actually right away with us, because the group just answers the calling of Magdalena – it was easy to follow, not many words to remember, and has an easy, nice melody. It is a call-and-response exercise. Magdalena used the ‘good-morning’ activity as a warm-up for her session with the YST Conservatory 1st year cohort, it was great to see the students moving and singing together and having a great time. The warm-up seemed to help them to be more focused during Magdalena’s workshop, as they were more comfortable with each other. The ‘good morning’ exercise was great to create a positive vibe among the group and help everyone start to focus, ready for the rest of the day’s meetings/activities. Dinah lead an exercise that she had experienced during an ICON (Innovative Conservatoire) seminar that we call “Listening to...” Our chosen topic was own practice as mentors and teachers. But this exercise can can be related to a topic or question pertinent to the meeting or in a one-to-one setting simply an issue an individual has on their mind. Then in pairs one speaks on their topic for 4 to 7 minutes and the partner listens without comment or silently influencing the speaker...holding the space for partner to think and speak. Then a short exchange where the facilitator asks "How was it to be listened to?" "How was it to listen?" The listener doesn't comment on speakers content only on the experience of the listening. Then they change over and at the end reflect together on the second experience and what the exercise brought. There are a series of responses which can be used building on the initial listening and used in a group setting. These can be: writing a letter, sources as a response, critical response, argument. These are documented in the ICON resources. I wrote a letter to myself to be read to the others in the group. I wrote about my situation as a teacher and especially my inner thoughts of the relation teacher-student. During my reading the letter out loud the other group members placed themselves in positions comfortable enough for focusing on listening. One sat just behind my back, one was laying on the floor, yet another one sat near the wall etc. I was deeply moved...because of the content of my letter or because of the listening from the others…? The “listening” is a strong tool to encourage someone to really share one's thoughts and feelings. After the reading of the letter the group members were welcome to give something back to me, in accordance to what they had heard; a tool, an advice, reflections etc. I realised that it’s so much more difficult to receive than to give. Observing the differences between listening, sharing, giving and receiving, this is a good exercise for the mentoring situation where the mentor/mentee share thoughts, feelings and advices between each other both in listening, sharing, giving and receiving. What have we been doing? Where are we at? What have we got? Intense, confusion, panic and suddenly pressure. How can we make this mod creative? Do we need a known process for thinking together under pressure as a thinking writing group and around a table? The Artist in the Corner - my first experience of this was at ICON in October 2017. A lovely and different way of responding as an artist rather than as a thinker/responder/feedback giver. I feel free when I am given this role - to adopt a new perspective, to work from my strengths and to be less directive, concrete and clear. I feel more room to open a dialogue or pose a question. In this instance, my first instinct is to draw on the wonderful feedback experience from the day before - to thank the group for their thinking, offering and hard work, for their generosity and time! As a composer and sound artist and someone interested in listening and landscape I decide to create a score from the group. I use phrases from our feedback - Inner Space, Let the Sound Take You By the Hand, Thresholds… each of these phrases becomes a movement of the piece. The work is in 12 movements, one for each of us in the group. Each person is given their ‘score’ and the parameters of the work - a walk from Yong Siew Toh Conservatory to the lunch hall. And we embark on the piece and make it together -- a sound walk - listening, sounding out, listening in and moving together. I am hoping it will allow a space for us to find understanding through performance, as individuals and collectively for us to find something together through ‘making’ that we couldn’t find through sitting around a table and discussing. As her gift and offering in return for our listening in to her art, Natasha asked us to do our usual daily ten minute walk to the lunch cafe a little different. She gave us each a small piece of paper with a word. Mine was ‘microscopic’. She asked us to move organically as a group, relating to this word, connecting to it, dialoguing with it, reflecting on this word, on its meaning, and expressing it in a personal way while walking. This was the first time in the week that we actually went outside the boundaries of the conservatory and we had to deal with other people, unknown to us, by-passers and locals who could witness us doing our ‘dance’ and ‘movement’ experiment. We were artists and at the same time exploring shared themes and inner questions. The strong connection to the local context became relevant and it made us being aware of a larger community besides our own group. At the same time, it allowed us to ‘move’ in a different way as a group and as ‘one’ organic group. It allowed us to get out of the ‘managerial board room mode’ (as Dinah puts it so eloquently), and tap from our natural born creative artistic expressive inner source. While doing that, several participants experienced on a personal level, the emergence of meaningful and rich information and relevant experience related to the meeting and the topic of 'good-mentoring' itself. Themes we were implicitly asked to deal with: the others, the environment, the local, the body, boundaries, translation of abstract language into physical movement, social constructed meaning experience, interpretation, personal free meaning. This - however small - allowed us to make a big step as a group researching and exploring the depths of mentoring. It allowed us to bring the creative artistic back into the curriculum development process. I got a word or a sentence on a small piece of paper, which was supposed to be expressed through my walking. We did this as a group exercise and as I relate to other people, I immediately observed the others moves and discovered that though all of us had different words to relate to, we often moved in the same way, which blocked me a little, as I wanted to find my explicit move connected to my word. And yet I felt safe and united with the others in the group, and I like that feeling of belonging. As we were outside the institution, walking/moving on a bridge among other people staring at our work, I felt alienated from other people and that took away some of my concentration. One of us was supposed to make stops here and there and we had to take notice of that, which kept the concentration of what was going on outside yourself on a high level. And at the same time I had to be inventive about my own moves in relationship to the word I had been given for the exercise. For me the challenge was to find a balance between my concentrating on finding my own moves in relation to the other group members moves. The balance of integrity and commitment. For the last couple of hours there was a sense of focus and efficiency. The questions that we had posed at the start of the week were reflected on. Did we managed to answer them? That could be debatable but in all cases our understanding had deepened and if answers had not been found, sometimes many more questions had been sparked and explored. This was an afternoon of final division of tasks, defining the output. Working in groups. There seemed to be a general feeling of having achieved something important and meaningful. We had deepened our understanding of mentoring by exploring feedback from students, tools and topics related to mentoring. At the core of it was the power of the group-mentoring approach as a way of learning together in a democratic way co-constructing meaning.